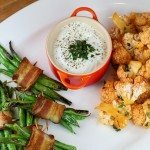 Grilled Party Appetizers | Food, glorious food! 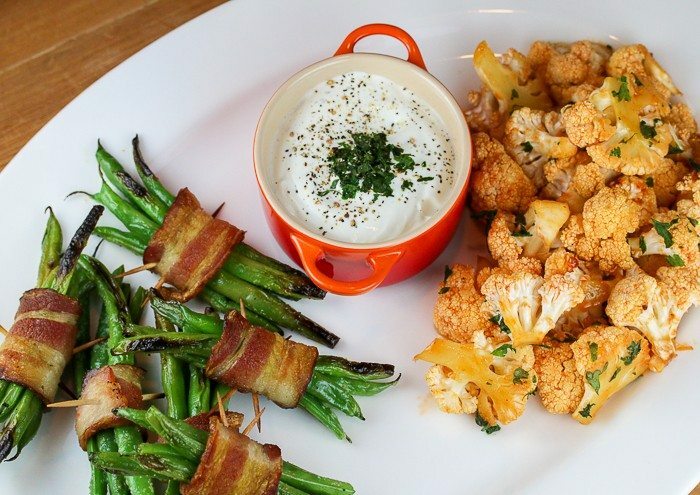 This contains two appetizers that are great for the holidays or any time of the year! They are easy to make, can be prepped in advance and take no time to cook. Soak the toothpicks in a bowl of water for at least 30 minutes to reduce burning on the grill. Set out a baking sheet and line it with paper towels. In a large skillet with straight sides, bring about 2 inches of salted water to a boil. If your grill has a side burner, you can do this step on the grill. Add the beans and cook for 4 minutes or until the beans are crisp-tender. Use a slotted spoon to remove them from the water and place on one end of the prepared baking sheet; pat dry. Bring water back to a boil, add the bacon and cook for 3 minutes to start the cooking process and remove some of the fat. Use tongs to remove the bacon from the water, place on paper towel-lined plate and pat dry. 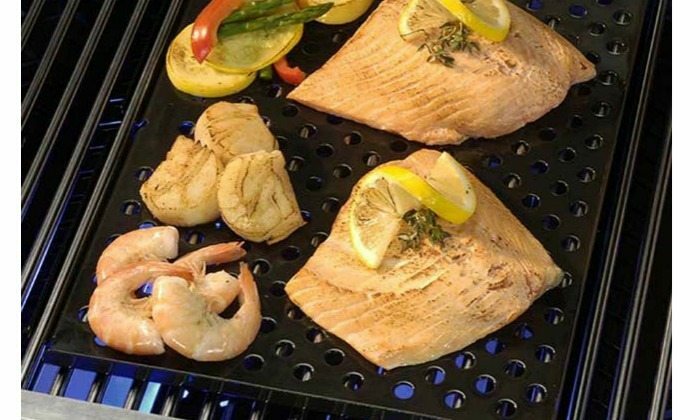 Set a CharBroil Chef's Delite Grill Topper on a sheet of parchment or foil. Spray lightly with cooking spray. Separate the beans into 16 equal portions. Gather each set, lining up the beans and pinching them together. 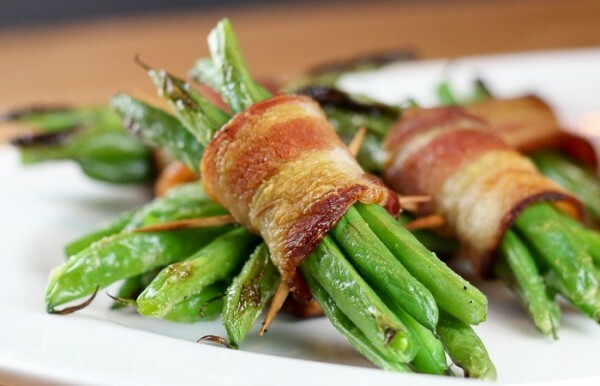 Wrap each set with one of the strips of par-cooked bacon. Use a toothpick to secure the bacon. In a small bowl, combine the melted butter with the onion and garlic powder. Brush the portion of the beans not covered with the bacon with the seasoned melted butter. Preheat your CharBroil gas or charcoal grill on high for 10 minutes. After 5 minutes, add the Grill Topper, close the lid and continue preheating it along with the grates. Set the prepared bacon bundles on the hot Grill Topper, reduce the heat to medium low and cook until the bacon is crispy, about 5 minutes per side, turning occasionally. Serve while hot. Place the cheese and milk in a microwave-safe bowl. Heat in 10-second bursts, stirring between each, until the cheese is melted. Whisk until smooth. Add the sour cream and black pepper, whisking until smooth and creamy. Taste and adjust seasonings. Pour into a serving bowl and sprinkle a few pieces of the cheese on the top if desired. Place the bowl on the serving platter. In a medium saucepan over low heat, melt the butter cubes. Add the hot sauce, brown sugar and lemon juice. Cook, whisking, until the sugar is fully dissolved. Taste and add more hot sauce or sugar if desired. Remove from the heat and let cool slightly while you prepare the cauliflower. Trim the leaves from the head of cauliflower and separate the florets, cutting them off the center stem. Cut any very large florets in half. Place the florets in a very large mixing bowl. Pour about half the buffalo sauce over the top and toss to evenly coat. Preheat the grill on high to about 400 degrees. Turn the heat off the burner on one end of the grill, turn the burner next to it to low and the other burners to about medium low. Spray a rimmed baking sheet with vegetable oil. 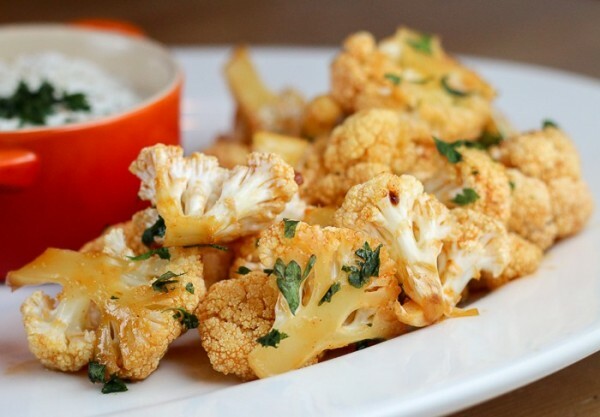 Pour the coated cauliflower florets onto a baking sheet, spreading them out into a single layer and place over the burner that was turned off. Close the lid and let cook about 5 minutes. Use a spatula to turn the florets. Cook until they are fork tender with a little resistance in the center, about 3 to 5 minutes longer. Remove from the heat, toss with the remaining hot sauce mixture and transfer to the serving platter with the bowl of blue cheese dipping sauce. Garnish with parsley and serve warm. The most common problem with grilling is that food tends to stick to the grill, but having a grill topper prevents this situation. This accessory is great especially for delicate foods as well as small pieces since it also prevents food from sliding in between the grates. If you love grilling your food at home this is definitely a must-have!